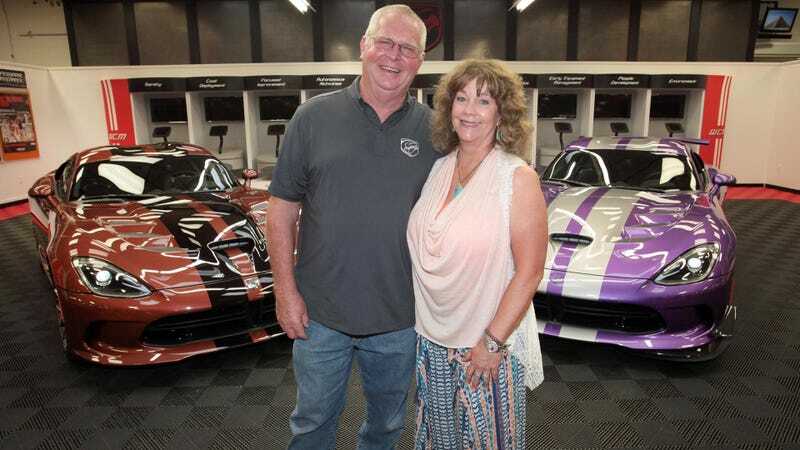 Wayne and D’Ann Rauh just collected two customized Dodge Viper GTCs from the Conner Avenue Assembly Plant, bringing their total collection to a whopping 79 Vipers. Only in Texas. Since Dodge will make you a Viper however the hell you want it, the retired oil transporters took advantage of the 1 of 1 program to end up with a brown Viper GTC with a black stripe and a purple Viper TA 2.0 with silver stripes. There’s more in this video, but pardon the horrendous audio during the interviews. Their collection, nicknamed “Viper’s Nest” consists of 79 V10s now. How many Vipers do you have? I’m at zero at the moment. Photo credit: Dodge. Hat tip to Jeff!